Sean Mackle (right) celebrates with Darren Murray after finding the net for Portadown against Ballymena United in Saturday's 1-1 draw. 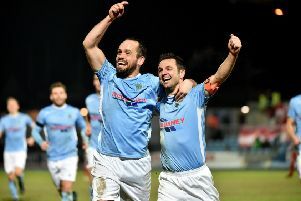 Pic by PressEye Ltd.
After the deflation of six successive defeats and elation of a last-gasp victory, Portadown met Ballymena United in search of solid signs of recovery. The 1-1 draw arrived with the Ports losing the lead and on the backfoot in terms of possession play - but, crucially, with an improved attacking threat. Dwayne Nelson was alert to save multiple efforts from Gary Twigg, Robert Garrett and Darren Murray. Portadown managed to gain the upper hand on 55 minutes thanks to a trademark Sean Mackle goal as the midfielder attacked the penalty area from deep to head home at a stretch and convert Twigg’s perfect cross. Twigg continued in his all-round role along the Ports frontline by finding space to collect Ken Oman’s upfield pass then ghosting past the exposed Nelson before displaying the composure to deliver. Ballymena enjoyed the upper hand in terms of time on the ball and left the sides level when Matthew Tipton’s left-wing cross was flicked on by David Cushley for Allan Jenkins to head past David Miskelly. Both sides felt frustration at golden opportunities squandered in the period between each goal. Murray failed to direct his header on target from a central spot after good work between Garrett and Chris Casement. A sliding Tipton then steered wide a Cushley cross from a few yards at the back post. Oman - the previous fixture’s hero with two late headers - met a Ross Redman corner-kick in the closing stages but his effort clipped the top of the crossbar. PORTADOWN: David Miskelly, Chris Ramsey, Ken Oman, Keith O’Hara, Ross Redman, Chris Casement, Michael Gault, Robert Garrett, Sean Mackle, Darren Murray, Gary Twigg. Subs: Tim Mouncey (on for Casement, 82 mins), Mark McAllister (on for Murray, 89 mins), Billy Brennan, Matt Parker, Jake Richardson.